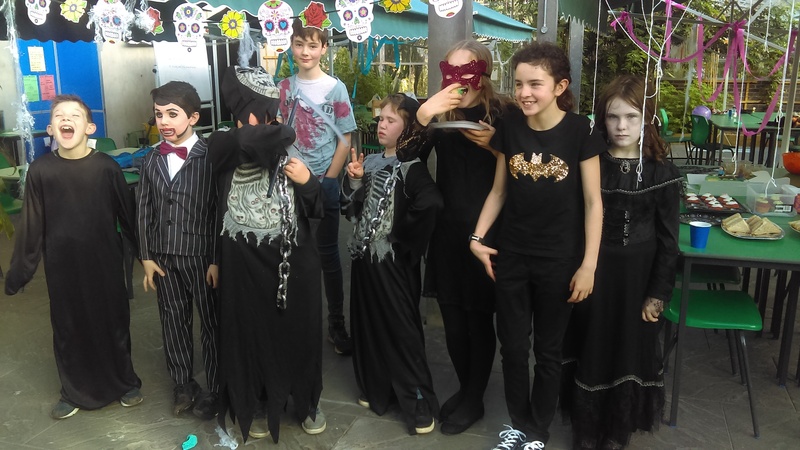 Just a quick, and very photograph heavy blog post, to thank everyone who made it to our Halloween party this afternoon. 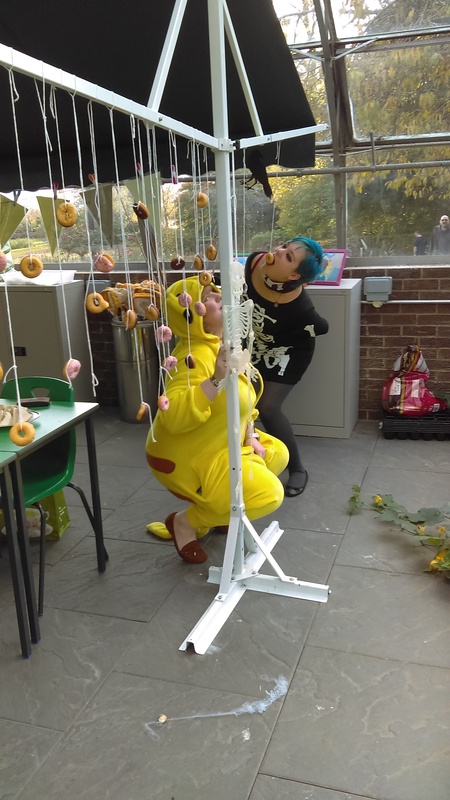 Us adults had lots of fun doing things like eating cake, running races dressed as mummies, ‘bobbing’ for doughnuts, making clay gravestones and looking at photographs of dead people. We hope all our members did too! 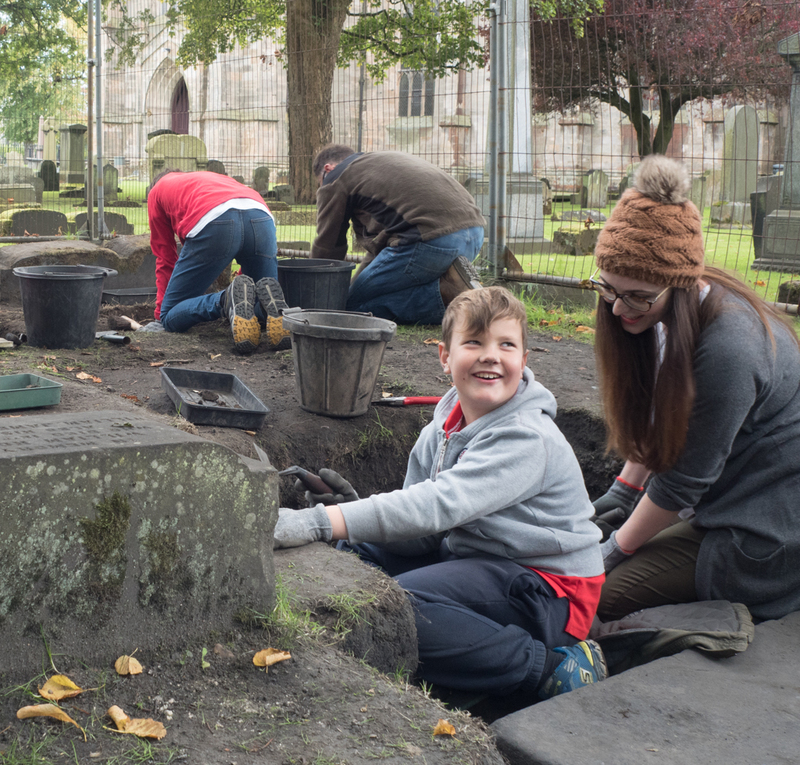 I’d also like to take the opportunity to welcome the newest member of the Dunfermline Young Archaeologists’ Club, Ryan, who came along for the first time today. 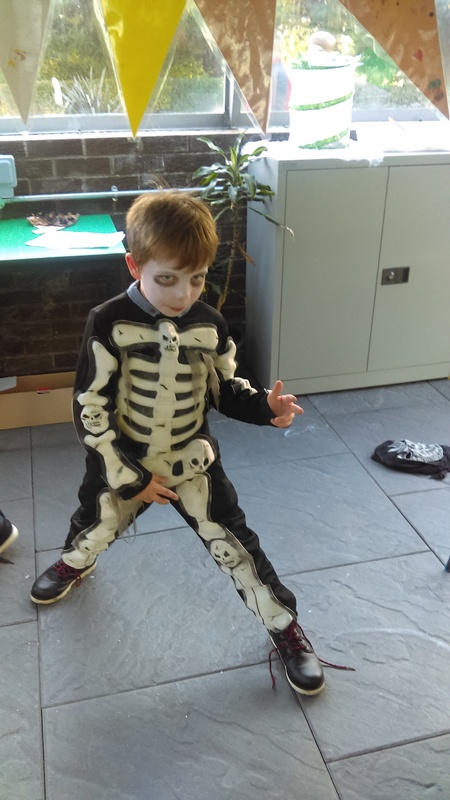 Ryan clearly has several excellent skills to bring to the club; an excellent eye for fancy dress and the ability to levitate (see photos below). Thanks also to Ryan’s responsible adults for helping us to dress the room am provding amazing cupcakes. Group photo in which Kathryn eats cake, Alexander gives us a cheeky smile and Katie looks simply terrifying. Seriously. I’m going to have nightmares. 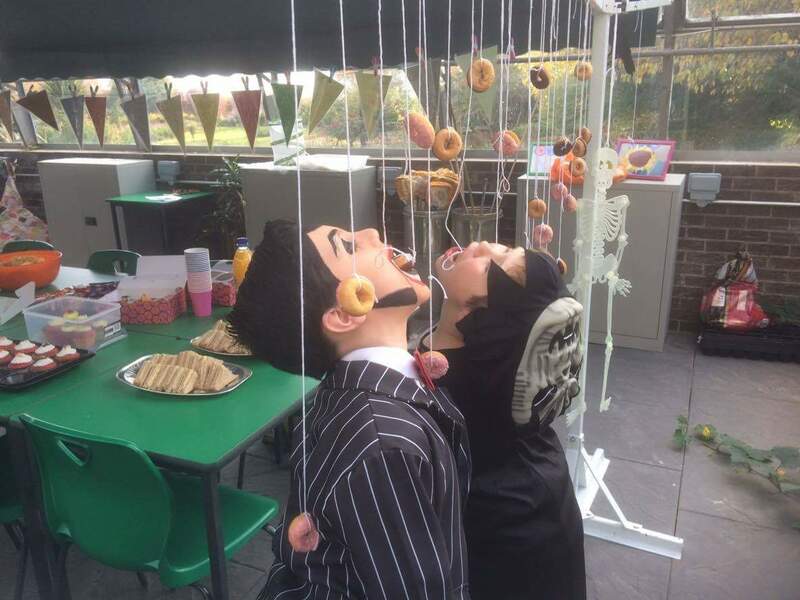 ‘Responsible adults’ eat cake before the children get a turn. Looking at photos of dead people. It was fun. Archie wows his adoring fans with his truly excellent 80s dance moves. 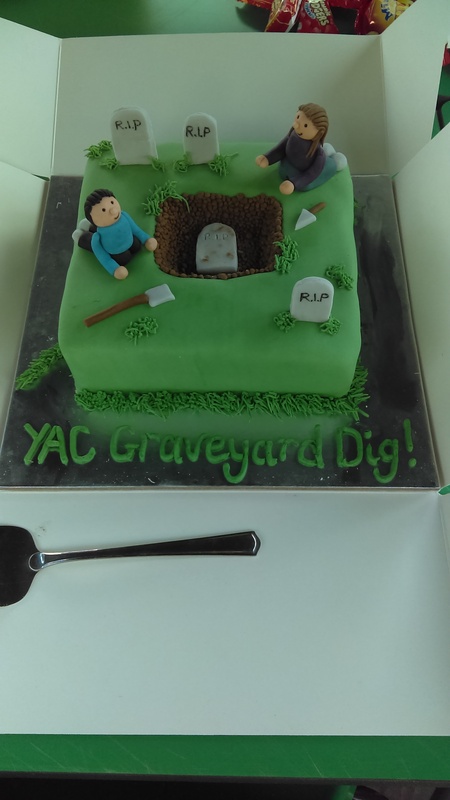 Fancy cake celebrating our graveyard dig. 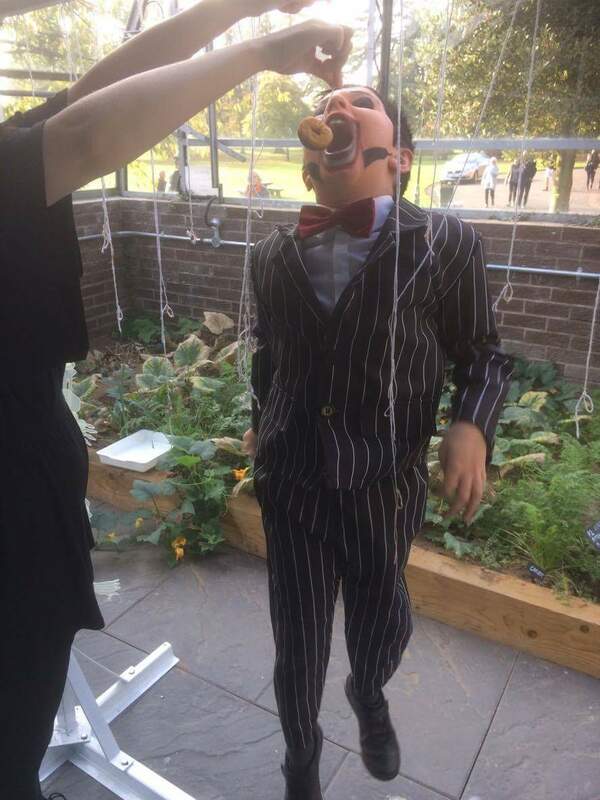 It did not taste of soil. Which is good. 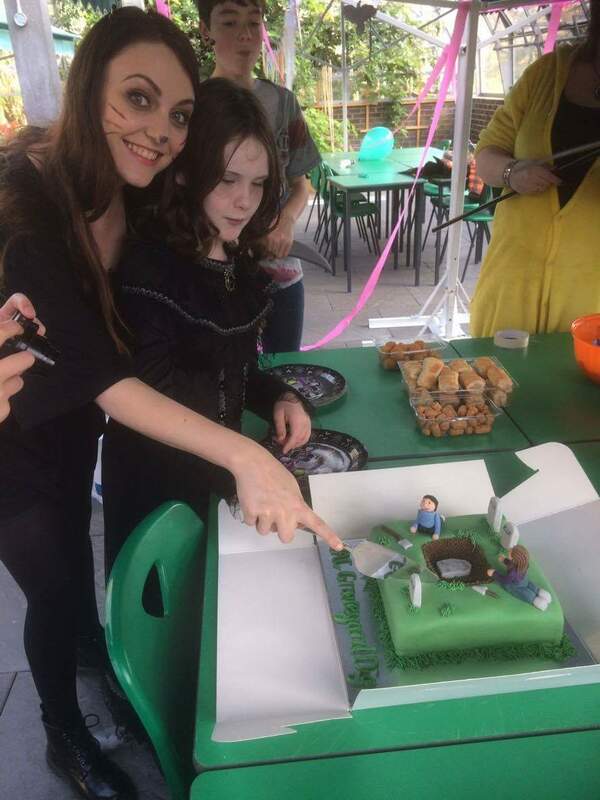 Charlotte and a small dead girl cut the cake. 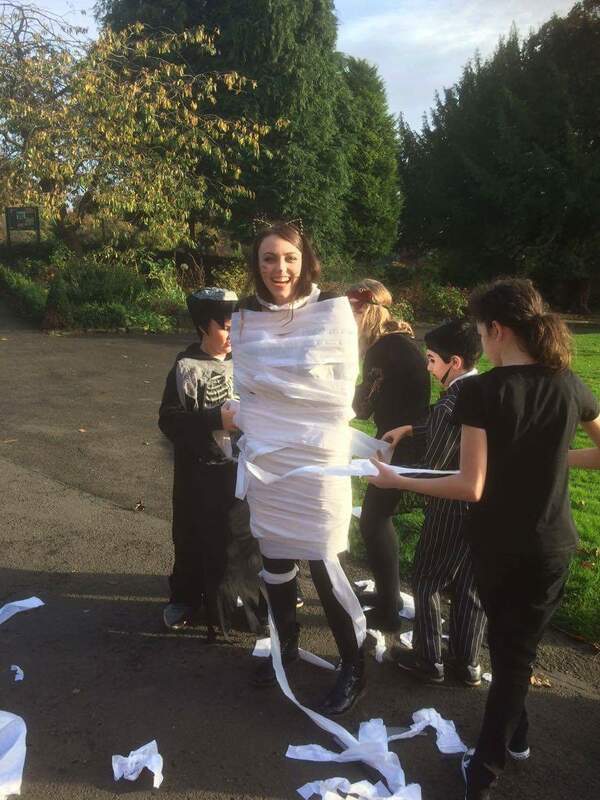 Charlie being mummified alive by her team. Charlotte’s team clearly had superior wrapping skills. And finally, I would like to share with you the video of the sporting event that everyone has been keenly anticipating this year. Some were tipping it to be bigger than the Olympic Games. 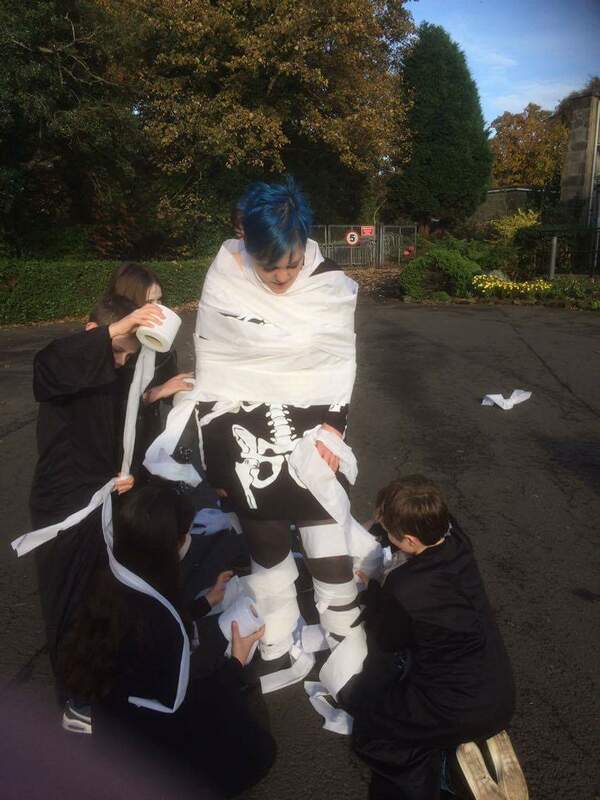 Yes, that’s right, you guessed it: The Charlie vs Charlotte mummified 50 metre sprint in Pittencrieff Park! Except, I can’t work out how to attach a video, so you’ll just have to believe me that it was thrilling! 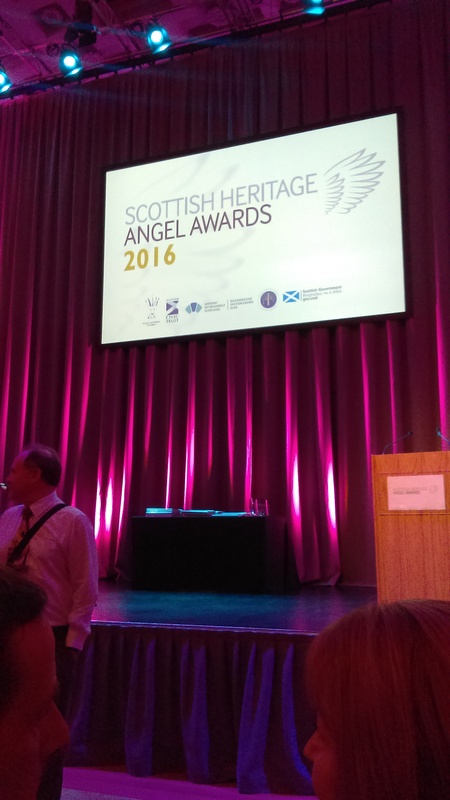 On 18th October 2016, two leaders, Charlotte and Dougie, and three members, Alexander, Erin and Kathryn attended the Scottish Heritage Angel Awards Ceremony. 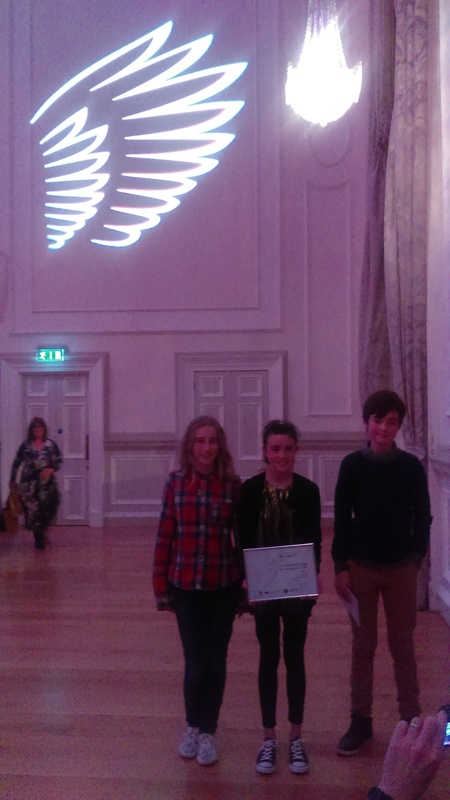 We were chuffed that the Dunfermline Young Archaeologisits’ Club was shortlisted for an award (Young Heritage Angel Category) and with the promise of a free buffet we thought we had better make the journey through to Edinburgh. We were very impressed with the grandeur of the Assembly Rooms and we were also very impressed that we could have unlimited orange juice and coca cola for the evening. I hope everyone brushed their teeth when they got home! The ceremony started with a video from Lord Andrew Lloyd Webber who reminded us just how fabulous we all are by talking about the importance of volunteering in heritage. Then we got to listen to some fabulous music from the Royal Conservatoire of Scotland. All very fancy. We listened intently to the information on each of the nominees for the first three categories – Investigating and Recording, Caring and Protecting and Sharing and Celebrating. 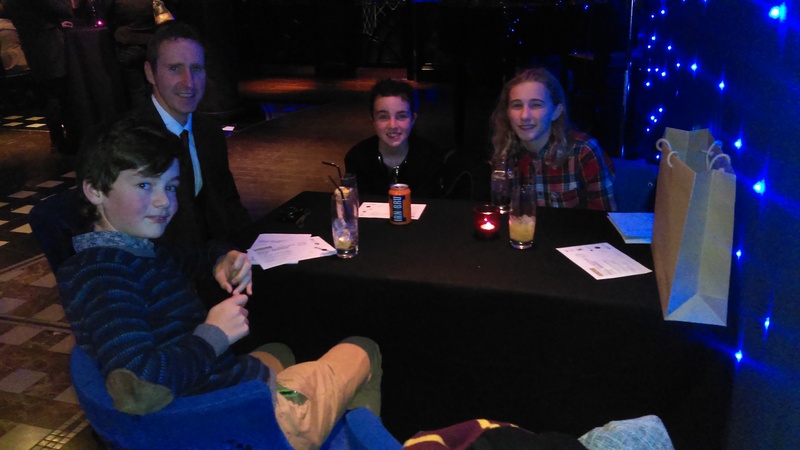 There were some very good entries and it was interesting to hear about different projects all over Scotland. 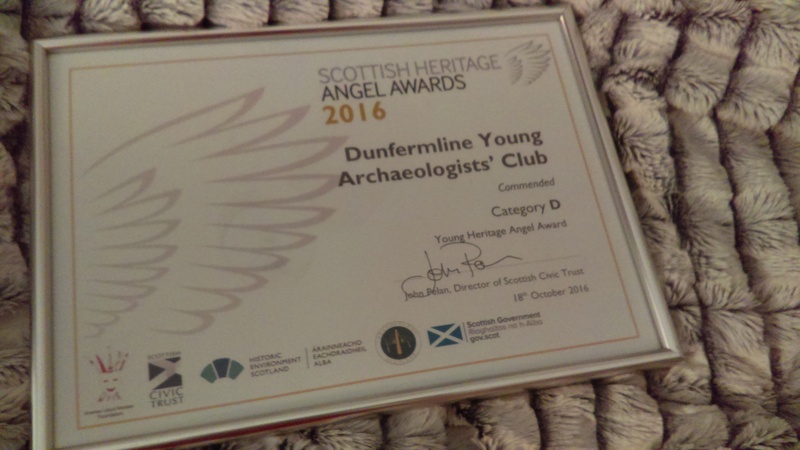 YAC from Scottish Heritage Angel Awards on Vimeo. Now, the bad news. Unfortunately we didn’t win. Sad face. 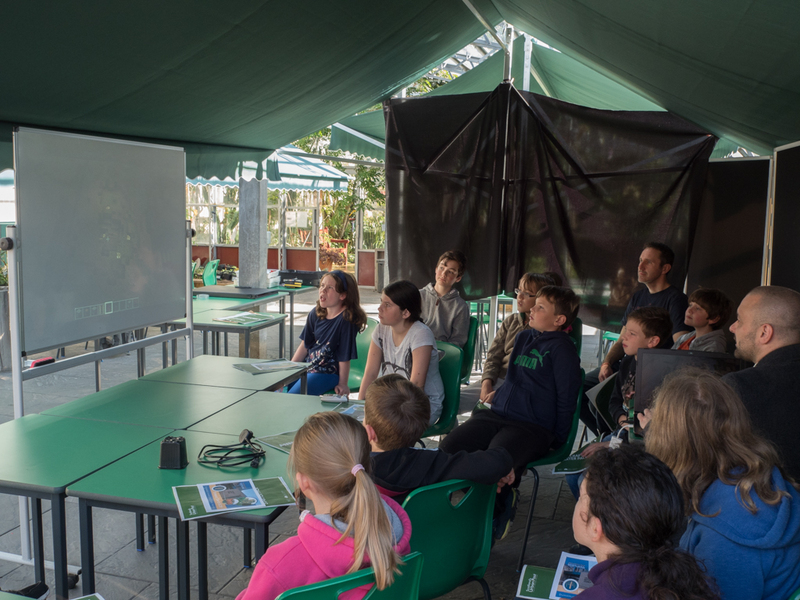 We were pipped to the post by ‘Dig TV’, a group of 13 year olds who made films about an archaeological excavation at Withorn. It sounded like a very interesting project and I think it is proper etiquette to say congratulations to them in situations like these. 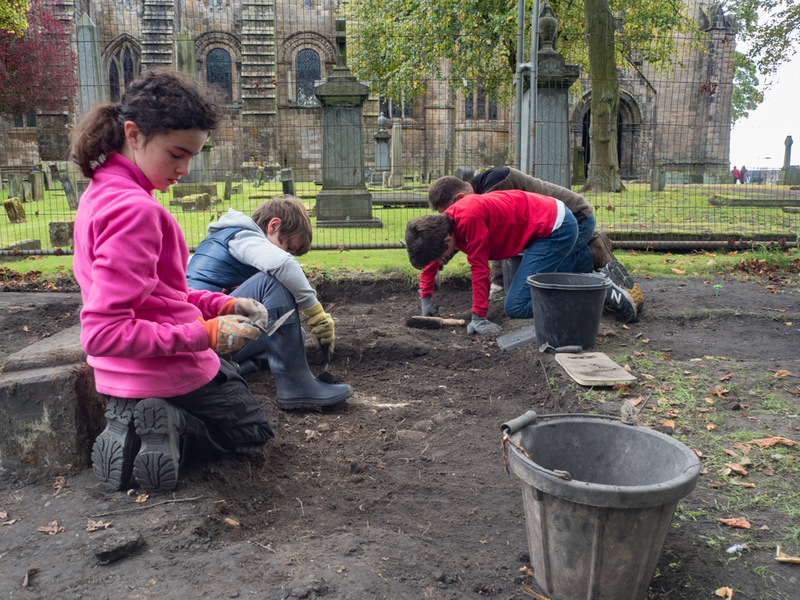 Although we didn’t win we are still very proud of our Young Archaeologists who have done an absolutely spectacular job working on the graveyard dig all summer (and last). You are all winners in our eyes! Although we didn’t win we did get a certificate of commendation. We sent Alexander up on stage to collect it. We don’t think he was very happy about that. Then came the best part of the evening: the after party. How three underagers were allowed in to a bar we will never know. Perhaps they all had fake ID. But we had a very nice time in Le Monde on George Street drinking coca cola and eating chicken on a stick. Look, here’s a photograph to prove it. We had a good turn out today with Alexander, Caelan, Erin and Ronan joined for the first time by Michal, who made an excellent start to his career in archaeology. Alexander very kindly let his dad Alan join in too. 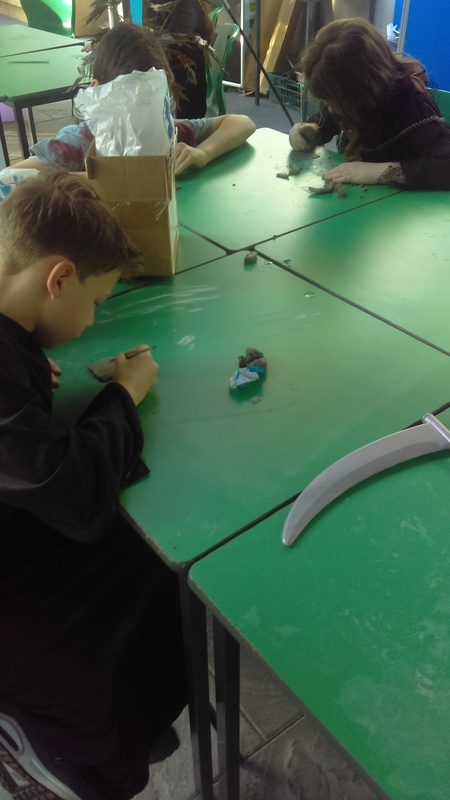 Dougie worked on exposing the edges of the large table stone, latterly with some help from Ronan. 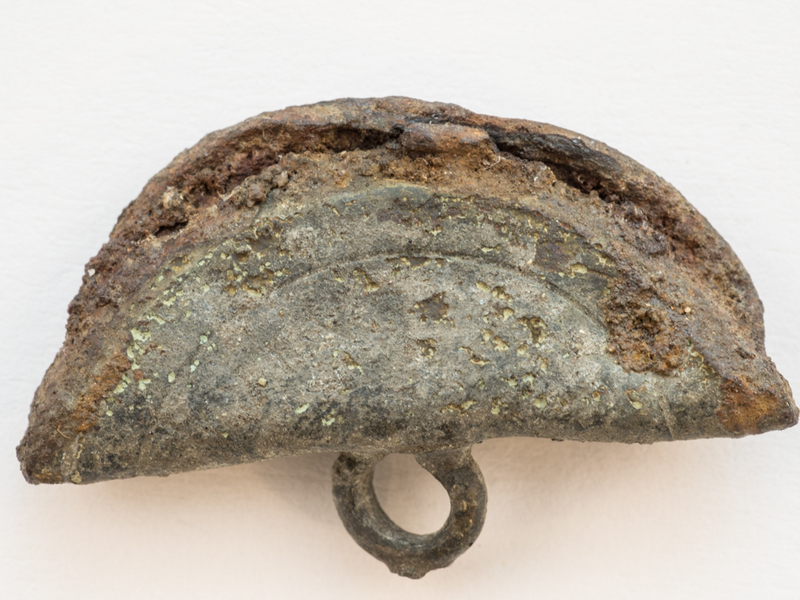 Charlotte and Michal worked in the trench immediately to the north, exposing the edges of the small 18th century marker. 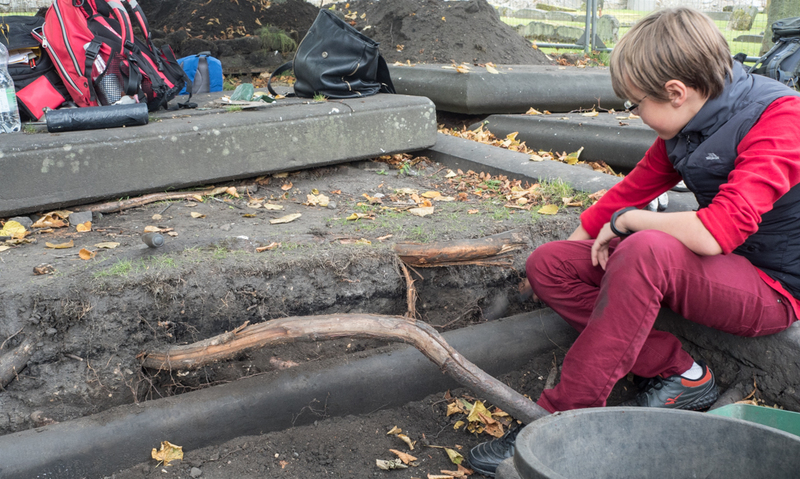 Caelan worked on exposing a curb stone that has been partly covered by tree roots. The soil is very compacted and dry in this area, so the going is quite hard. The large table stone on the ground above the curb is not part of the original grave. A skull fragment, lower jaw and tooth were recovered from this area as part of the infill. Grave plot with curb stone. Note the thin layer of burnt material dumped on top. We had expected at least one new gravestone to be uncovered today in a new trench worked on mostly by Erin, Ronan, Alexander and his dad. Probing the area had led us to believe that there was at least one gravestone just beneath the turf. We were quite wrong. Instead we found an impressive amount of rubble, presumably laid down in 1927 to fill a hole. An edge to the rubble area is emerging, so we started the process of cleaning it up so that it can be photographed and planned. The joy of cleaning muddy rubble! 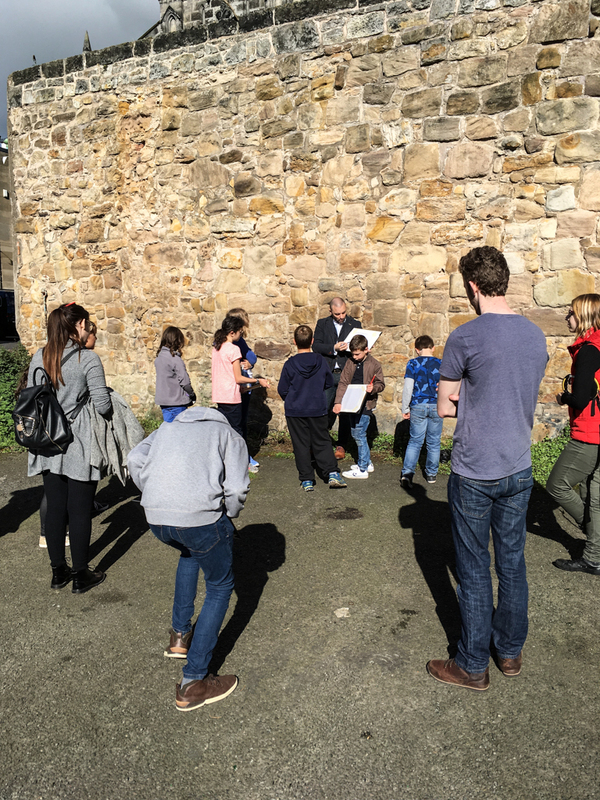 Fiona and Bryony from Scotland’s Urban Past and Stephen Reid from ImmersiveMinds came along to Dunfermline on Saturday and Sunday to start us off on our project to recreate medieval Abbot House in Minecraft. We met in the GlassRoom in Pittencrieff Park and whilst there were certainly a couple of laptops in the room, no one, except Stephen very, very briefly, got anywhere near Minecraft. So, what on earth were we doing over the weekend? Well, any building project, whether in the real world of brick and stone, or in the virtual world of Minecraft’s 1m blocks, requires careful planning. Where do the walls go, how long, how high, how thick; where are the doors and windows and what do they look like? Recreating a historic building that has been considerably mucked about with over the centuries requires even more planning. After all, despite the name, no one really knows for sure who built Abbot House, why they built it or even when. We have clues, hidden in the fabric of the building itself (yes, bricks and mortar can tell stories if you take the time to learn their language) and in scanty documentary evidence, but that’s all. In other words, we needed to switch on our imaginations and starting making educated guesses. We all spent a lot of the weekend starting to work out what those guesses will be. 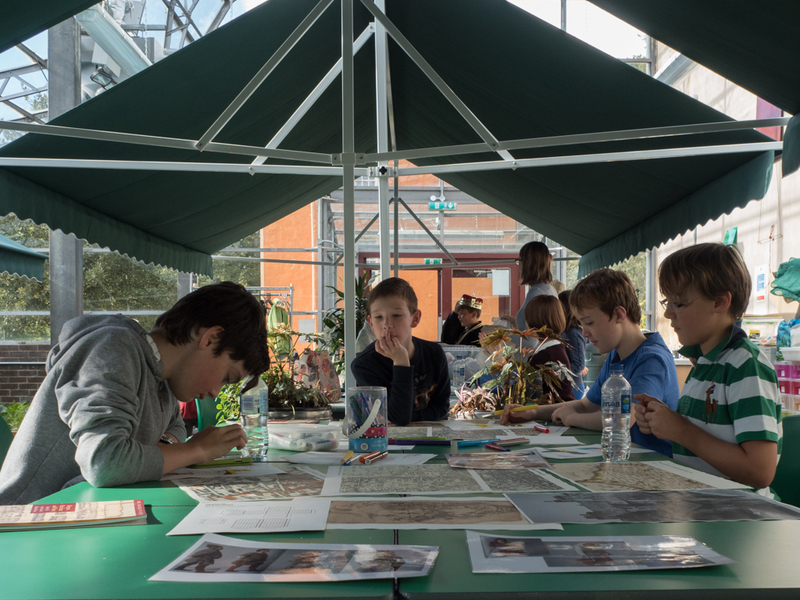 On Saturday YAC members got down to the important task of planning their own Minecraft characters; the avatars who will do all the work in Minecraft Dunfermline. 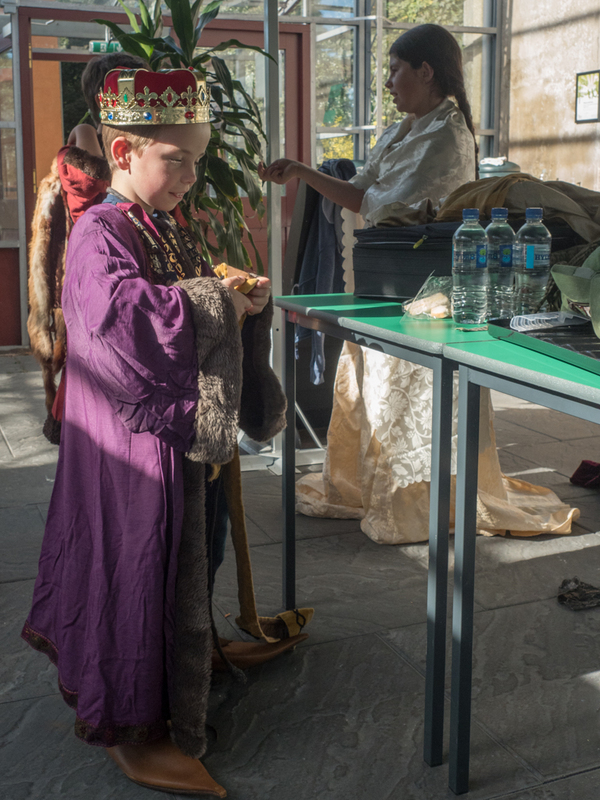 They spent time thinking about who would have lived in late medieval Dunfermline and what clothes they might have worn. To help us we had photographs of re-enactors and even some of the medieval costumes originally commissioned for Abbot House in the 1990’s for visiting school children to wear. After lunch we carried out what archaeologists call a desk-based survey. 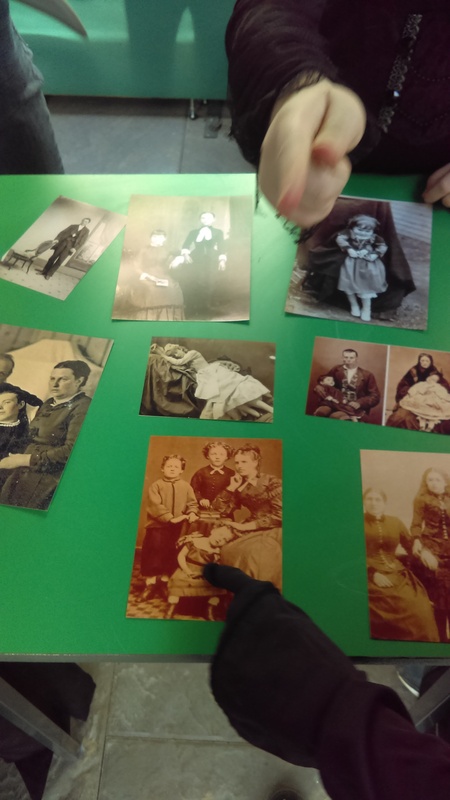 We pondered long and hard over old maps and photographs; evidence from Abbot House’s past. We tried to tease out what we could about the building when it was new. There are maps and plans dating from the 18th century onwards. Although Abbot House was already centuries old by then, Dunfermline had perhaps not changed so much. 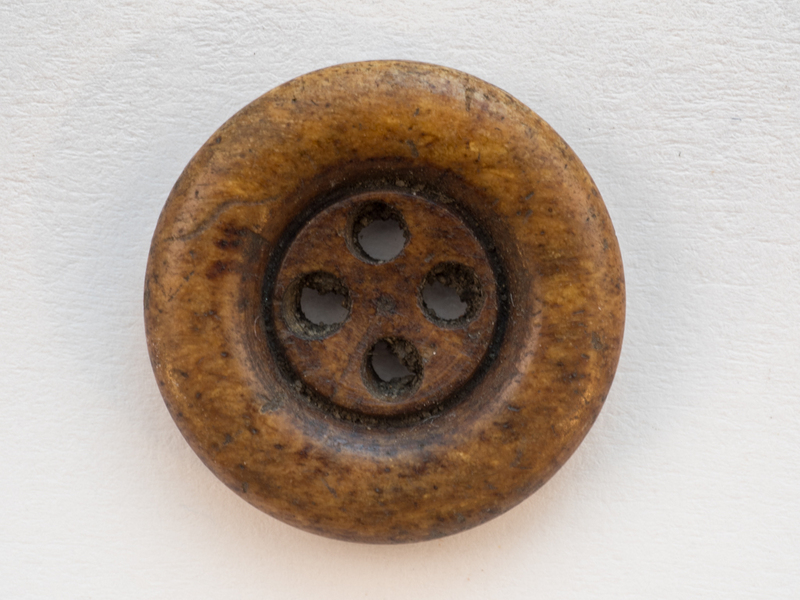 You can view many of these yourself online on the wonderful National Library of Scotland Web site. Maps of Dunfermline can be found here. There is a remarkable old plan of the town made in 1771 that you see here on the ScotlandsPlaces Web site. We also looked over photographs from the Historic Environment Scotland archives. Again, many of these images are available online here. Some are photographs taken years ago, when Abbot House was divided up into old, but ordinary houses. Others show the building stripped bare, ready to be transformed into a historical gem, far too important for anyone to merely live in any more. Abbot’s House from North East, 1930’s Can you see the bits of the building that aren’t there any more? 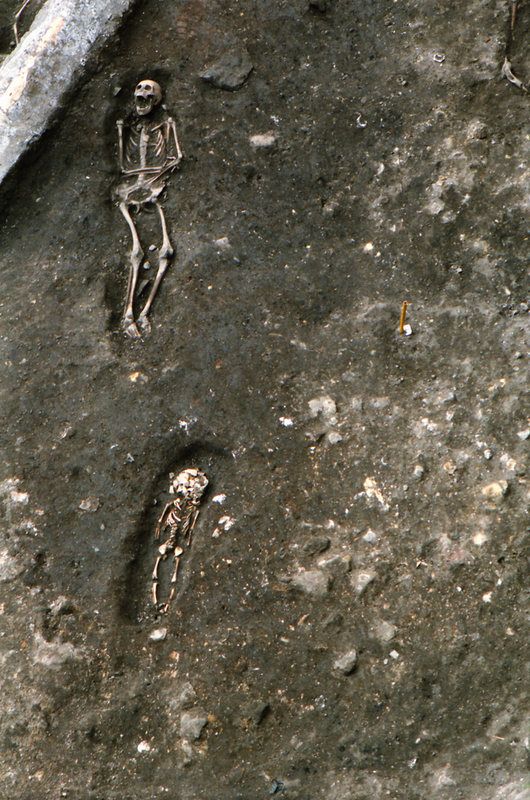 The photograph above was taken during the excavation of 1992. The dark ground at the front of the photograph is the rubbishy remains of medieval Maygate. Can you make out the rectangular, blocked window that once looked out onto that same street? The very bottom of the wall, the lowest courses of stone, stick out and look quite different to those above. These are perhaps all that is left of an even older wall that was knocked down and used as the foundation for the front of the new building. So what had that wall been for? Is it a clue as to who built Abbot House over it? On Sunday we carried out the next part of our survey. We went out and looked. Remember the stones of the old wall on which Abbot House stands? One theory is that it was once part of a great wall that stretched round the monastery and its lands. As it happens, a tiny fragment of that wall still survives not far from Abbot House, so we went to take a look. The front of the wall on Canmore Street is not so very impressive. We measured, we drew, we made a few notes. Then we went to look at the back of the wall. Bit different isn’t it? Firstly the wall looks much taller. We quickly realised that the ground level is lower round the back, so the bottom of the wall at the front must actually be below pavement level! Has the ground level at the front of the wall risen over the years, but not at the back? We can see that in Abbot House. The ground floor and front door are all much lower than current street level. When we put the monastery wall into Minecraft should we use the height at the front or the height at the back? 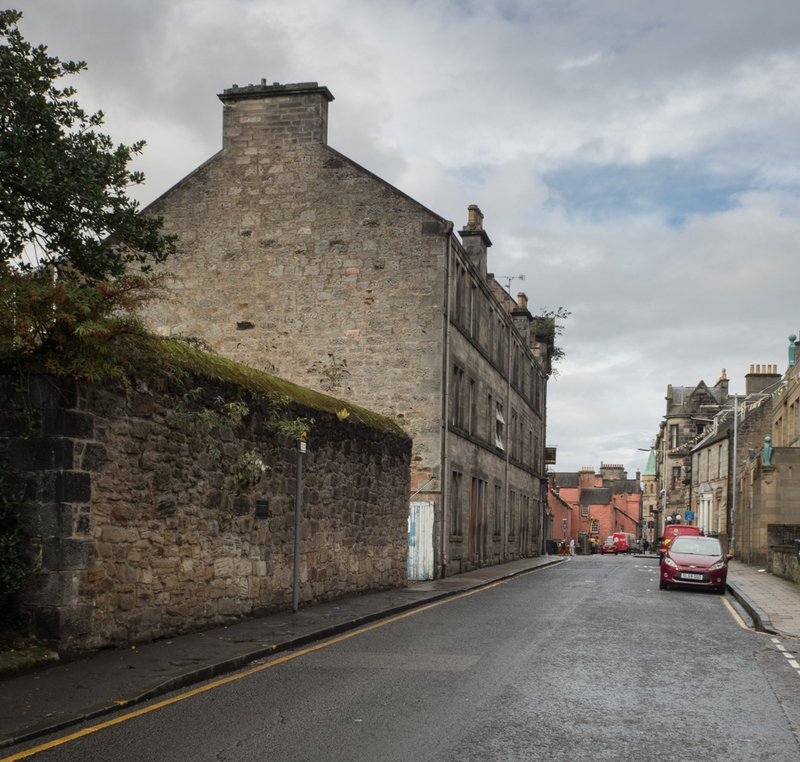 We followed the line that the monastery wall must once have taken, back along Canmore Street towards Abbot House itself. We had intended to take measurements that we could use to work out how big Abbot House, medieval style, should be in Minecraft. 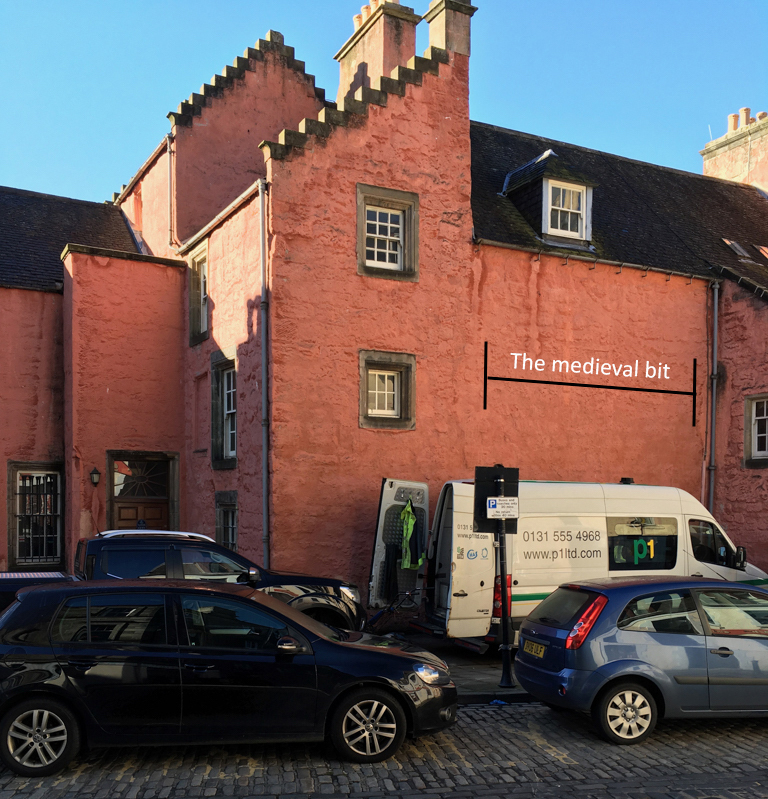 Alas, there was a big white problem parked right in front of the short bit of original, medieval front wall of Abbot House still visible. Never mind, we thought, we still have our maps and even some architectural drawings made in the 1950’s and 60’s. However, these were all drawn to different scales, some are in metres, others in feet and inches, and so calculating the length of the monastery wall from the surviving bit on Canmore Street along to Abbot House and then the frontage, width and height of Abbot House itself and converting all of that into Minecraft blocks proved to be a bit tricky. Brains were definitely hurting by the end if the day. If all that isn’t bad enough, we don’t know that Abbot House was definitely built into the monastery wall. We don’t even know if the monastery wall carried on along Maygate. 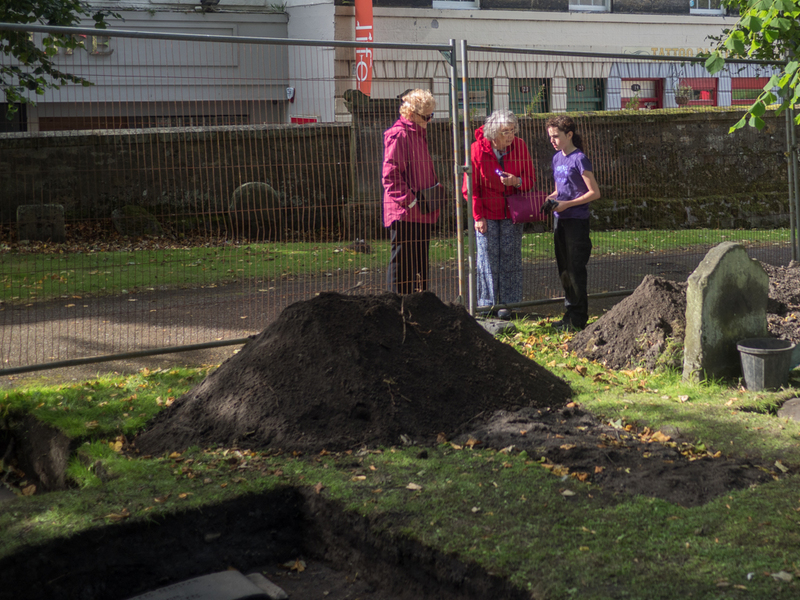 We do know that there was also a wall around the kirkyard and that must have been somewhere around there. We are sure that Abbot House garden was once part of the cemetery, because there are still medieval graves beneath it. 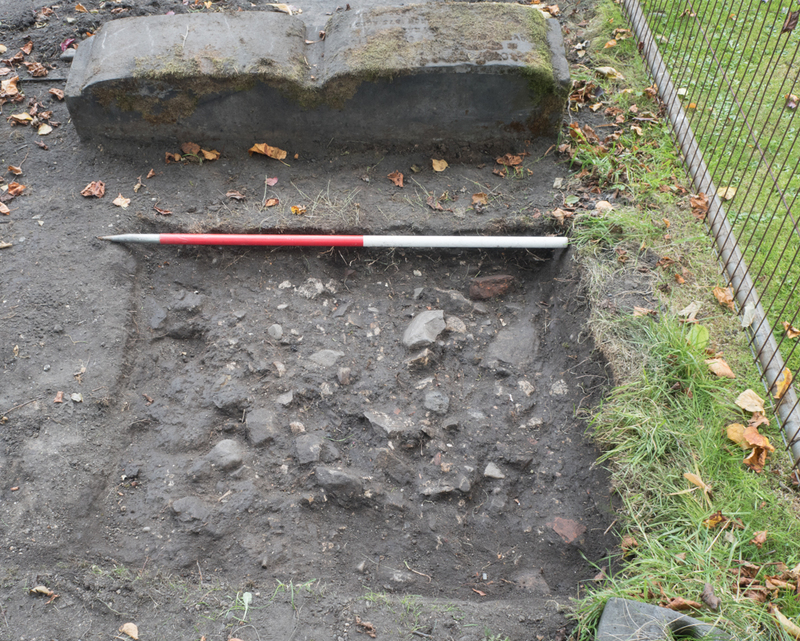 We even know from a legal document of 1499 that there was a house with a slate roof (and therefore with strong, probably stone walls) on the kirkyard wall. 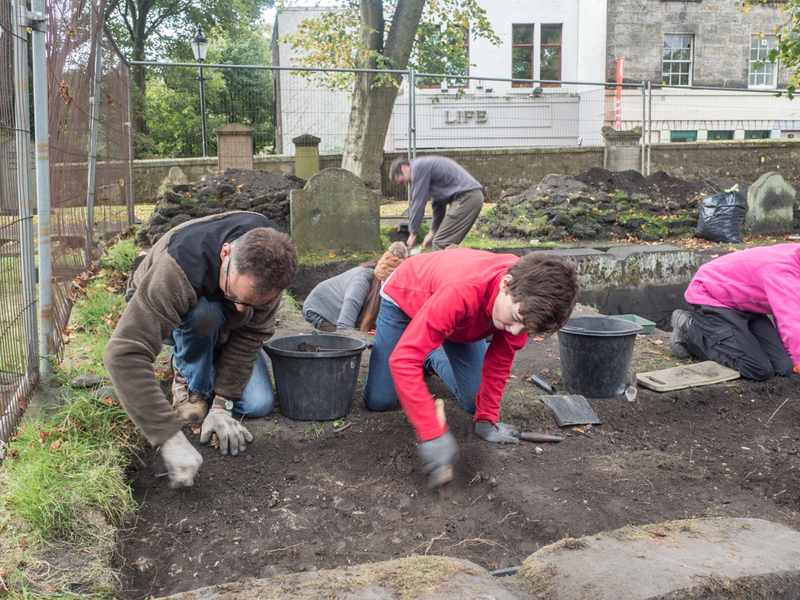 But was the kirkyard wall thick enough to use as the foundation of the front wall of a large, stone building? These questions may never be answered, but they are important to understanding why Abbot House was built and who by. 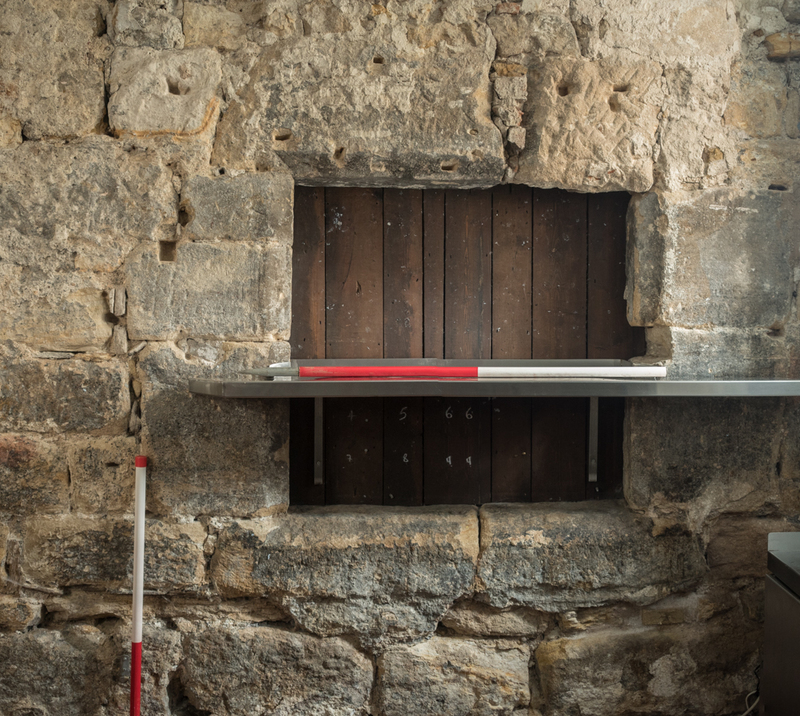 If it was inserted into the monastery wall, then it was most likely built by the monks for some purpose connected with the life of the monastery and Abbey. 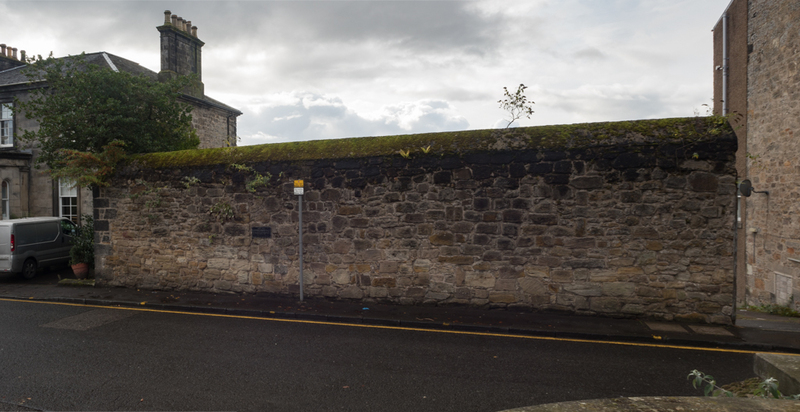 If Abbot House was built into the kirkyard wall, then it perhaps it had nothing to do with the monastery at all. Maybe it was built as a home and workshops by a well-to-do citizen of Dunfermline? Building in Minecraft gives us a wonderful opportunity to try out some of these ideas, and who knows, maybe come up with new ones. In the end we might well build several experimental, medieval Abbot Houses for Minecraft visitors to wander around and decide for themselves who erected this amazingly complicated and confusing building and what they did with it. 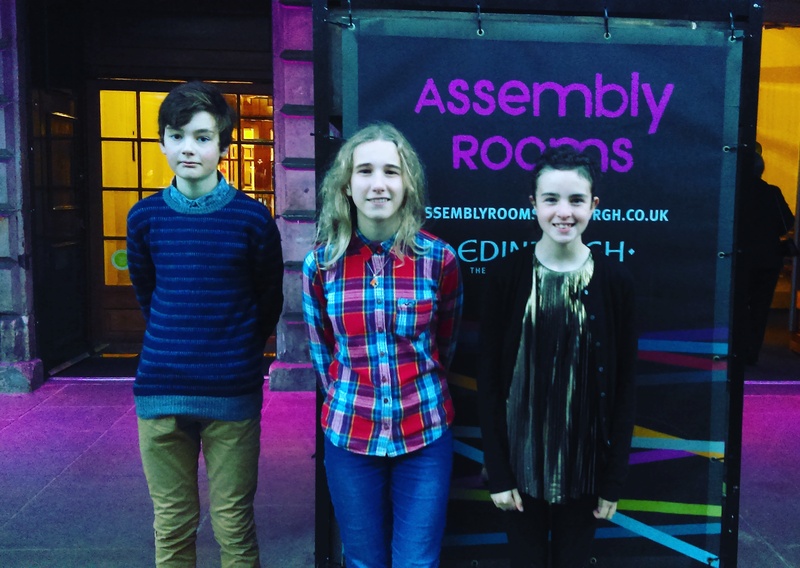 Our third member Blog contribution is by Erin. She has been a stalwart member of the project, along with her dad Dougie, over the last two summers. 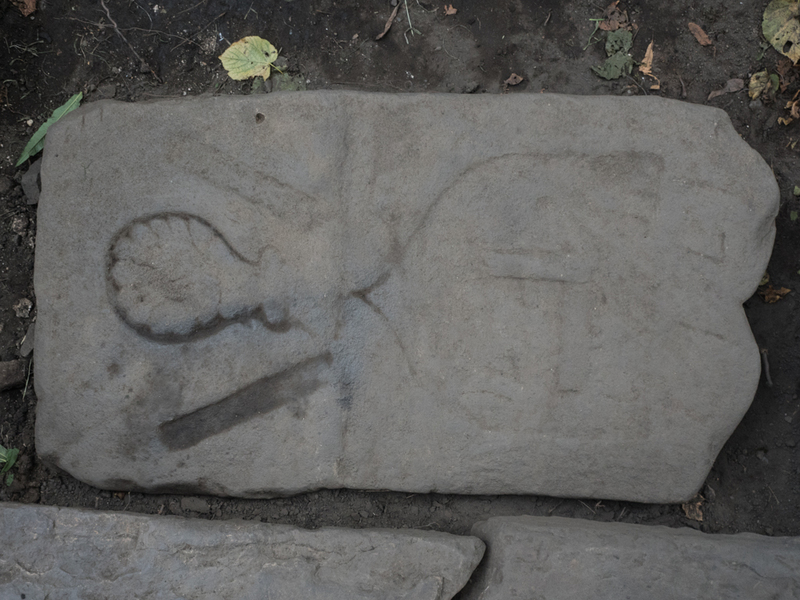 She shares her reflections on the project and takes a look at just why we come across so many buried gravestones and strange finds. Wow, another amazing day at the graveyard, two new members came along to try out. They were Ronan and Caelan, who seemed to enjoy themselves, fingers crossed they will come back (They did!). As always we had a lot of interest in what we are doing from people who were visiting the abbey and graveyard. People often ask what we are doing, and why kids are doing it! Others are interested because they see all of the gravestones. I don’t think people understand what is on their doorstep. People are amazed the children can get involved with archaeology and are surprised about the project. They often have lots of questions so here is a little bit of the history as to why we are doing the dig and what we find. 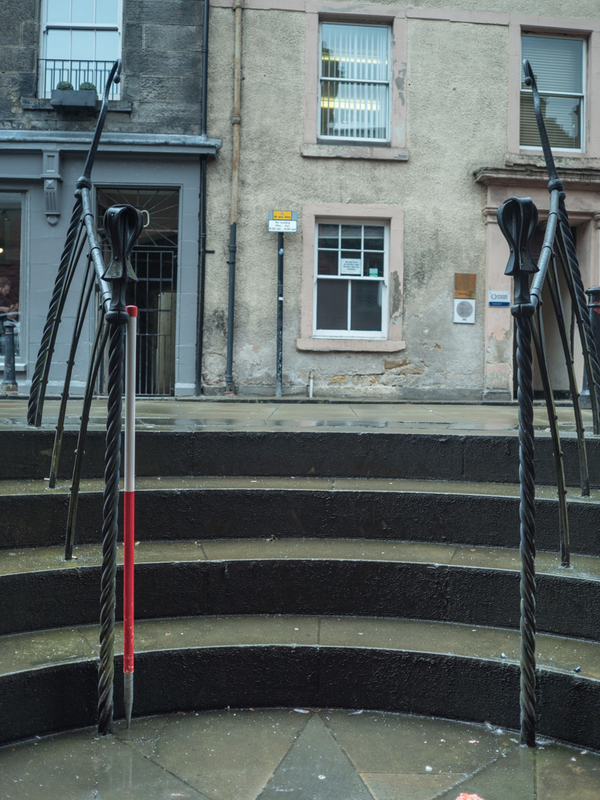 The graveyard has been in use for about 800 years and there are records that show by the mid-1600s that the Kirkyard had become very marshy and swampy and would flood during heavy rain. All of this water resulted in the ground becoming uneven and caused some of the gravestones to sink. Over a number of years drainage works were carried out and this appears to have sorted the problem. 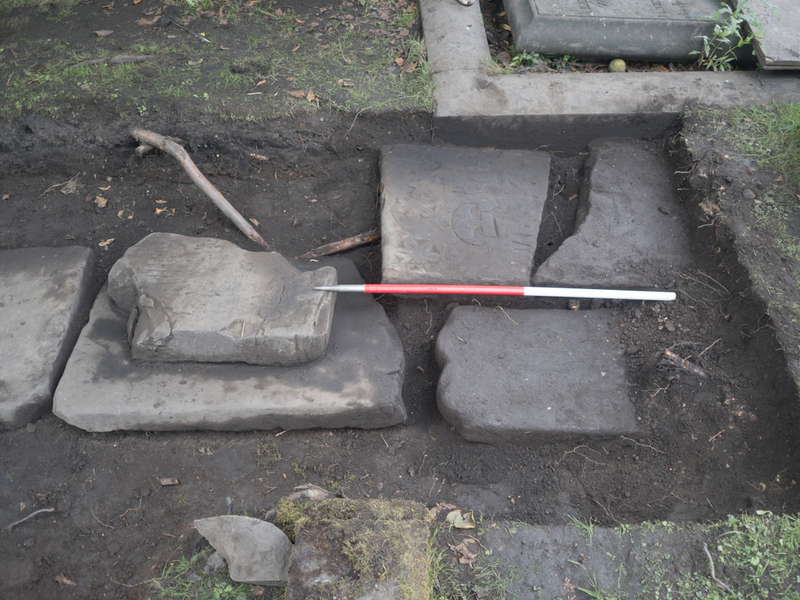 Records also show that the Kirk Session had ordered that all headstones had to be laid flat on the ground as they thought it would be easier to carry bodies through the Kirkyard to where they were to be buried. Maybe this was also an indication of how uneven the ground was at this time. 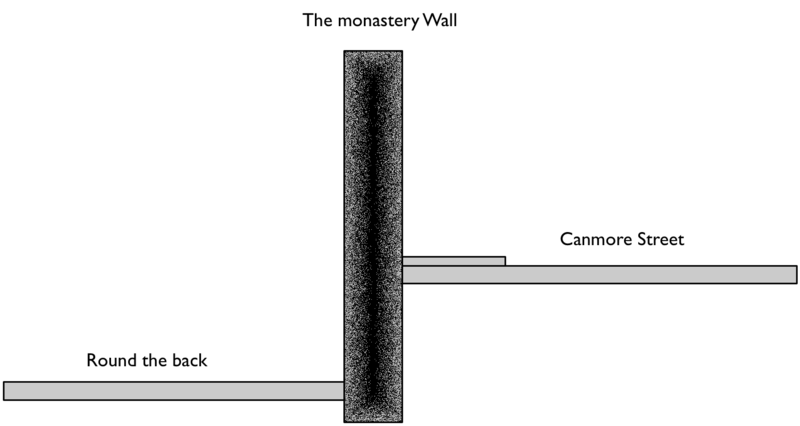 This rule of having flat stones continued until 1869. In 1927 the graveyard superintendent got material to level the Kirkyard from a site in Dunfermline. 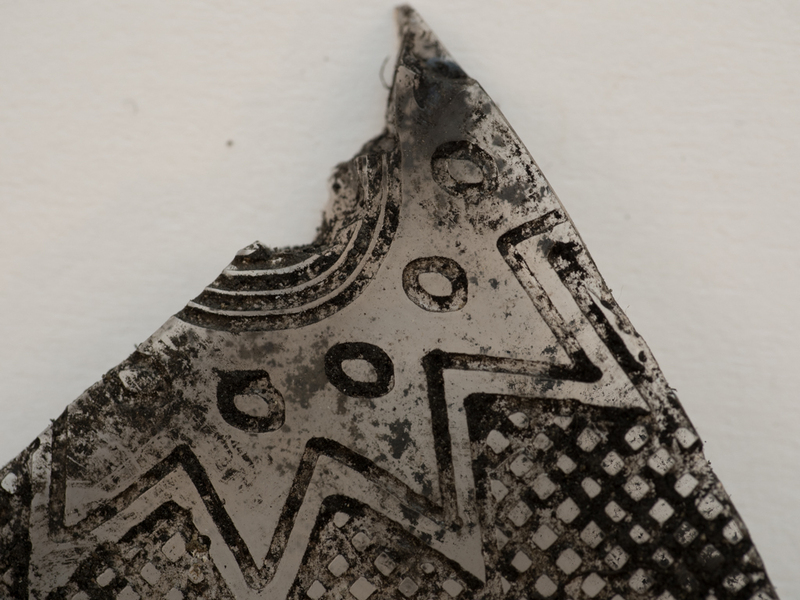 From our dig it would appear that this material was mostly rubbish with pieces of roof tiles, rubble, glass and broken pottery with pockets of Oyster shells and ash from fires. Maybe in 1927 they were not concerned about preserving history as they just covered over any gravestones that were below the level which they filled too. 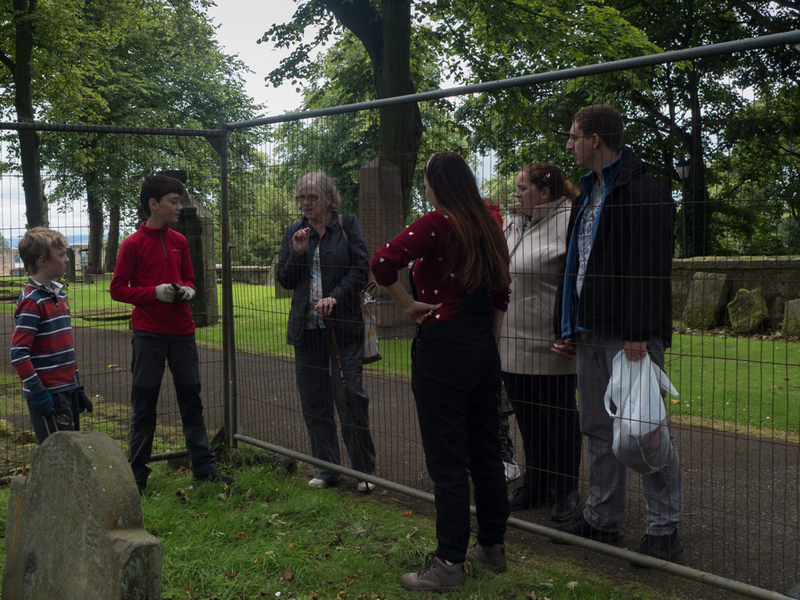 Our project is to try and find the gravestones that had been covered so that we can record the stones and have some research done to find out more about the people buried in the graveyard. As we dig to find the stones we get lots of great finds from all the rubbish that has been used to fill in the graveyard. We find lots of small items such as clay pipe stems, buttons and even a thimble and as we are in a graveyard we also come across lots of bones and teeth! This gives us a chance to look at the diets of the people who died and also look for any diseases or malnutrition as they show in the bones (see Alexander’s post). We do not just dig! 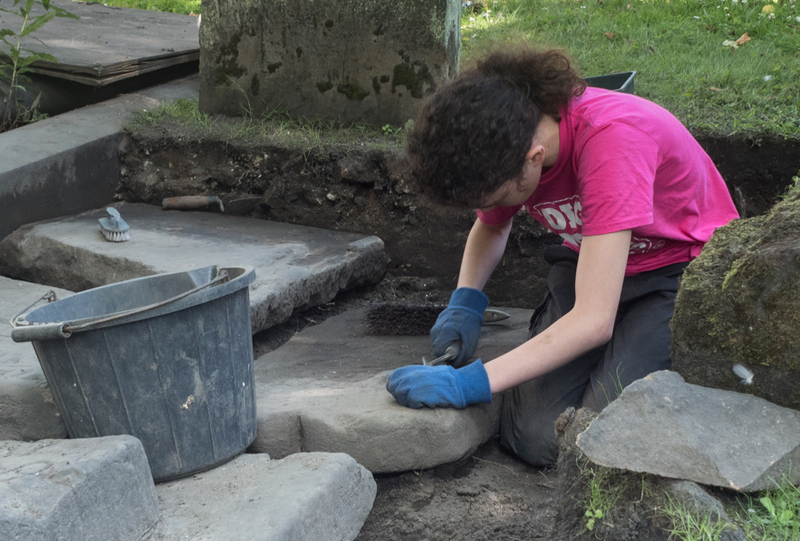 We have to catalogue and bag our finds, photograph the gravestones that we discover and also draw plans of the site so that in the future we know where all the stones are. This is because once we are finished all the soil has to be returned and the stones will be covered once more. Archaeology and local history is good fun. Me and everyone else at YAC really enjoy learning about history and of course love digging. I hope the project will go on for a long time into the future as it gets kids out of the house and away from the gadgets. It also means we can contribute to discovering local history and get to share it with everyone. I really enjoy coming to YAC!